Today I have to give a special birthday shout-out to my mama. 35 years ago, she got a birthday present four days early, when she had me. Yep, that’s right, my birthday is four days before my mama’s. Best birthday present eva, amiright?? But really, I am blessed to have her as my mama, and I am the person I am today in large-part because of her. Although my love of cooking didn’t come until a little later in my life, she was a perfect example of a working mother and wife, who still put a home-cooked meal on the table every night. She’s the reason that food and cooking is a big part of the way I show caring and love to those who are important in my life. It’s a priorityin my life, in my marriage, for me to make sure my husband (and someday family) are well-fed and have home-cooked meals to look forward to. Now if I could just get the whole breakfast thing into that routine, we’d be golden. Ha! So, happy, happy birthday Mama! I’ve always had a love for sandwiches. In fact, if someone asked me what my favorite food is, or if I could only eat one thing for the rest of my life what would it be, I’d have to say sandwiches. With chips on them. Yes, I’m a weirdo and I like chips on my sandwiches. Anywho…this particular sandwich I didn’t eat chips on. Because it’s a panini. What’s the difference, you ask? Well, for one, it’s sort of “sealed” by the cheese and who am I to break that seal to put chips on it?? And also, the bread is a little crispy from the panini press, so I don’t miss the crunch so much. Shrug. Who knows? 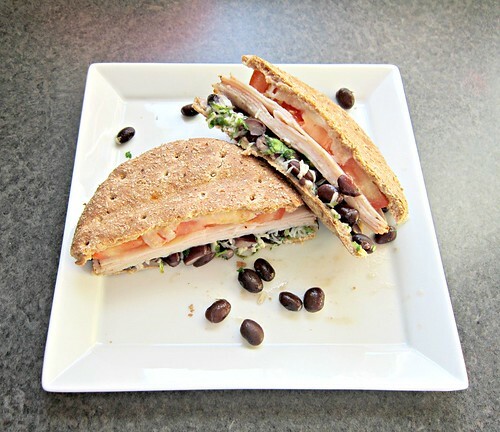 This particular panini has a lot going on, but in a good way. The cilantro, lime, and salsa verde mixed into the black beans truly is the star. 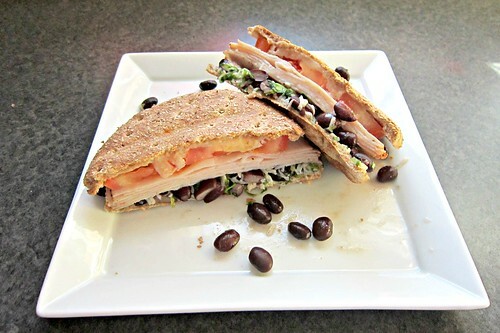 I mean, sure, the turkey, tomato and cheese are important, but cilantro lime black beans…amazing. No chips alongside, but sweet potato fries instead. And it was quite the perfect little lunch. Mama would be proud. Well, she always is, but she’d like the creativity of this panini. Even if it wasn’t my own. In a food processor, combine the cilantro, honey, lime juice and zest, salt and pepper, and salsa verde. Blend until coarsely chopped. Place black beans in a medium bowl, add the cilantro mixture to the beans, and stir to combine. Add a tablespoon or two of mozzarella and stir again. Sprinkle a thin layer of mozzarella on 4 slices of bread, cover with the black bean mixture (1/4-1/2 cup depending on your preference.) Top with 5-6 slices of turkey, 1-2 tomato slices, and cover with a think layer of cheese and the top slice of bread. Place each sandwich in a warmed panini press, or heat on a skillet (a la grilled cheese style) until both sides are browned and cheese is melted. Repeat until all are done. Remove to a plate and slice in half, if you like, and devour!